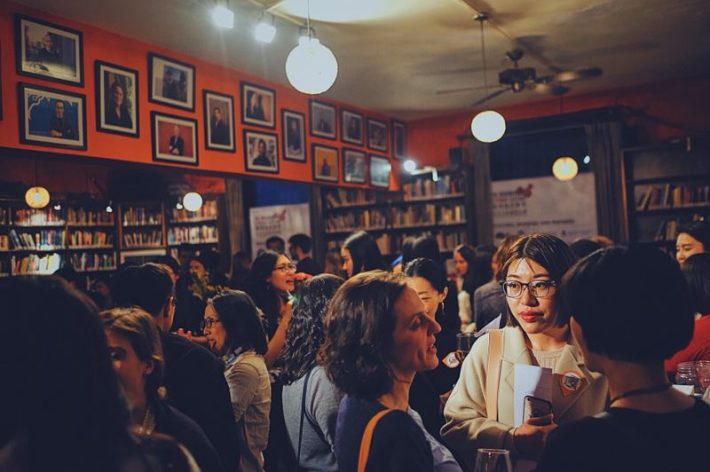 NüVoices is an international editorial collective gathering veteran and emerging writers, journalists, translators and artists to celebrate and support the diverse creative work of self-identified women working on the subject of China (broadly defined). Our chapters include Beijing, Shanghai, Hong Kong, Taipei and Berlin and we’re excited to launch our first North American chapter in New York! Free entry; Beer and wine will be served. The event will start at 7pm, but feel free to come earlier at 6:30pm. The panel will be followed by mingling with a great community of people! We have the place to ourselves until 10 pm. As a collective, we welcome participation from writers and artists as well as all readers and art consumers regardless of gender. In addition to the upcoming print anthology, our website, www.nuvoices.com, regularly publishes essays, articles, multimedia projects and other original content. Our bi-weekly podcast features women’s and minorities’ voices on a range of topical issues. Leta Hong Fincher, Rebecca Karl, and Lu Pin discuss contemporary feminist organizing in China against the authoritarian, patriarchal Xi Jinping administration. Leta Hong Fincher’s new book, Betraying Big Brother: The Feminist Awakening in China will be released by Verso on September 25, 2018. Called “fascinating and earnest” by Publishers Weekly, Betraying Big Brother follows the story of the Feminist Five, five leading Chinese feminist activists who were arrested, detained, and tortured by the regime in 2015. But the Five are only symbols of a much larger feminist movement of university students, civil rights lawyers, labor activists, performance artists, and online warriors prompting an unprecedented awakening among China’s educated, urban women. Tracing the rise of a new feminist consciousness now finding expression through the #MeToo movement, and describing how the Communist regime has suppressed the history of its own feminist struggles, Betraying Big Brother is a story of how the movement against patriarchy could reconfigure China and the world. Rebecca E. Karl teaches history at New York University (in New York). Books include The Magic of Concepts: History and the Economic in Twentieth-Century China (Duke UP 2017), Mao Zedong and China in the Twentieth-Century World: A Brief History (Duke UP 2010), and a co-edited/ co-translated volume, with Lydia Liu and Dorothy Ko, The Birth of Chinese Feminism: Essential Texts in Transnational Theory (Columbia UP 2013). The latter introduces to an English-language audience the little-known anarchist-feminist from early-20th century China, He-Yin Zhen, through a systematic translation of her major essays and a thorough analysis of her vital theorization of feminism for China’s and the world’s modern age. Forthcoming is a small volume, to be published by Verso, tentatively entitled China’s Revolutions: From Then to Now. Lü Pin（吕频）is a Chinese feminist activist focusing on strategic advocacy to combat gender-based discrimination and violence. She started her work on women’s rights in the late 1990s. In 2009, she founded Feminist Voices, China’s largest new media platform on women’s issues. Since 2012, she has been devoted to supporting the activism of young feminists across China. She now resides in Albany, New York, where she continues to follow the feminist movement in China closely. The discussion will be moderated by NüVoices chair Joanna Chiu, a former China correspondent, with contributions by NüVoices vice-chair Alice Xin Liu, a translator and writer based in Beijing. Looking forward to seeing you on November 1!